What Are The Top Tech Events In Ireland For 2016? 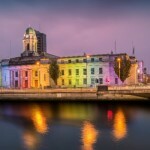 While Ireland is losing the jewel in its tech crown with the Web Summit moving to Lisbon there are still plenty of good tech events taking place up and down the country this year. Thanks to the success of the Web Summit and with so many of the world’s biggest tech companies based on our shores, Ireland has firmly put itself on the tech map. This year promises to be another busy one on the tech front with plenty to keep hardened tech heads and those with only a passing interest happy. No matter..